This is the BRAND NEW Avatar G212 Compact guitar speaker cabinet. This is the type of compact cab with rear slot porting bass design that was popular in the ’90s. It’s a great sounding grab and go 212 cab that has a big full sound in a small package. This compact 212sounds great with two Celestion Classic Lead 80s but you do have other choices for the sales price of $469. Free Shipping Included. Choose from Celestion Lead 80s, Greenbacks, Vintage 30, G12H30 70th Yr Anniversary, G12K100 , G12T75s or any mix of those. Please see the speaker drop down menu for other speaker upgrades or scroll to the bottom and click ‘none’ for the empty cab speakerless price if you already have two speakers. The cab is made from Quality voidless 13 ply Baltic Birch 3/4 inch on all sides and features box finger joints. 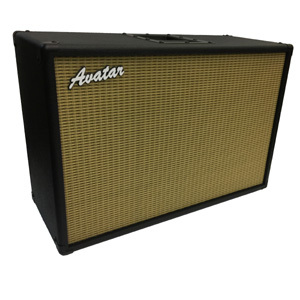 The cabs are in stock and ready to ship in black tolex with wheat grill cloth. Dimensions: 26.5″ Wide x 11″ Deep x 18.75″ High including rubber feet. Weight: 48 lbs loaded with dual Celestions with 50 oz magnets. Speakerless cab is 27 lbs.